On Friday, we visited a place to go to in search of old rusty stuff. Stuff I can use in my artwork. 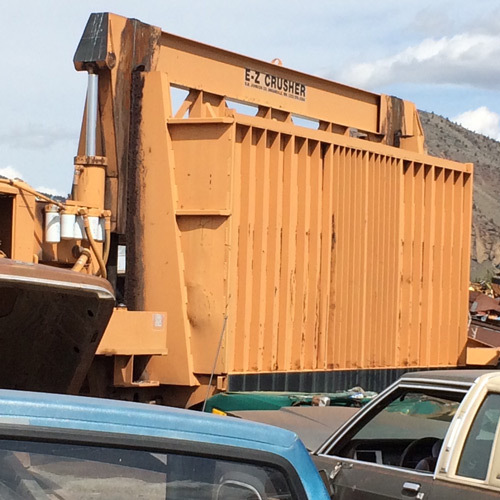 I've been to salvage yards in other Oregon towns, but none of those are like this place. I hesitate to divulge the name and location of this "hidden treasure", as my friend who tipped me off dubbed it. But I don't think there's any harm in doing so. It is very out of the way, especially for people living in the Portland area, Willamette Valley, or anywhere else urban. 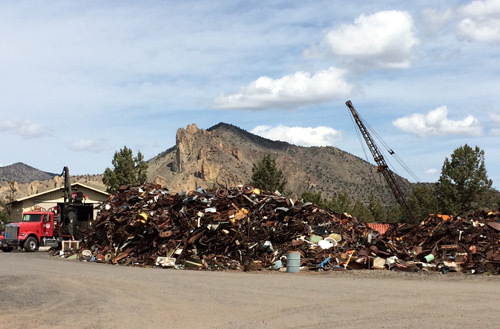 Midway between Redmond and Terrebonne in central Oregon, at the base of Smith Rocks, you can find Swift and McCormick Metal Processors. Expecting to find some small rusted bits and pieces I could salvage for future art work, I encountered something else entirely. 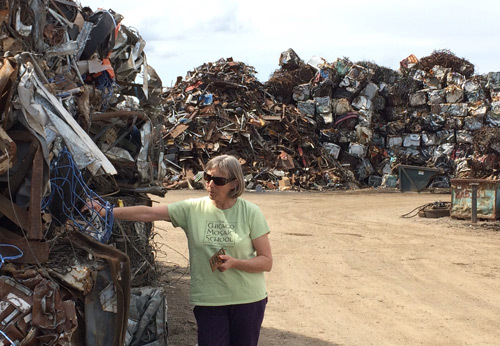 Mountains of discarded metal. Anything and everything that is made of metal, that wears out, rusts, breaks or otherwise becomes useless. In piles so large that it is nearly impossible find small enough things you can even lift or untangle. But that was okay for my first visit. Because what else we got from our visit was a cool experience. Stepping into the first pile I came to. Strolling around the grounds, Bob and I encountered a quiet calm. There were people working, but not much was going on. We were free to poke around the whole place, gather what we could. Iron scrap is 30¢ a pound, and we were instructed to take whatever we want to the small scale at a building in the back. With Smith Rocks behind the salvage yard. Still life in the weeds. Before doing that, we wandered around. This landscape was so unexpected, it got me thinking about how much waste the world generates. Without regard to what happens to it, really. At least the material here can be repurposed, melted down to become something else, but I don't know. There's so much. How long as all this stuff been accumulating here? And is continually added to?